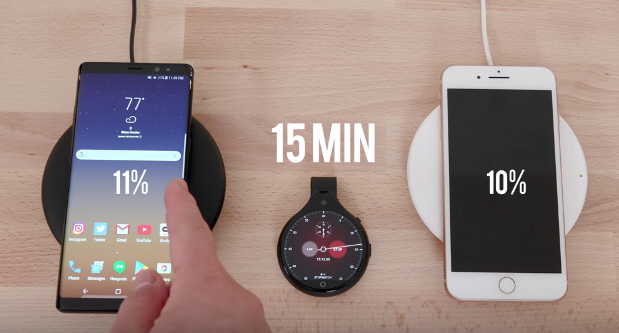 YouTube tech reviewer Danny Winget has put the iPhone 8 Plus and Galaxy Note 8 in a head-to-head wireless charging test, to let viewers know how much juice you can get at certain time intervals. The test shows the iPhone 8 Plus (2691mAh battery) using the Belkin Boost Up wireless charging pad for iPhone 8/iPhone X, which offers charging at 7.5W—but these new iPhones for now are limited to 5W wireless charging. Apple has stated a software update (via The Loop) is coming to allow wireless charging speeds to reach 7.5W. Meanwhile, the Samsung Galaxy Note 8 (3300mAh battery) uses the company’s fast wireless charger. Both phones were put into Airplane Mode and all background apps were shut down. If you only have 15 mins to wireless charge, the iPhone 8 Plus will take you to 10%, while the Note 8 goes to 11%. Again, wireless charging is more for the convenience when it comes to charging your phone, but fast charging via cable is still your best bet if you’re in a rush. Apple’s iPhone 8 models and iPhone X support fast charging, but requires a USB-C to Lightning cable and the company’s 29W, 61W or 87W Type- C Power Adapter.